Pet of the Month is back! Every month we are featuring one pet on our Facebook cover photo and website. April’s Pet of the Month is Julia! 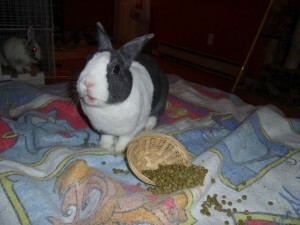 Julia was adopted through the Vancouver Rabbit Rescue Association about 3.5 years ago, as she was found loose at UBC. She has 3 boyfriends (Chino, Cid, and Alvin) that she is bonded to. She loves lounging by the fireplace, running around on the grass, snuggling with her boys, treats (all treats) and veggies. Her favourite veggie is kale. She is an expert at bunstruction, and loves destroying anything from towels, cardboard, newspaper and toys. Her favourite veterinarian is Dr. Hardin. Julia has been through a lot over the last 1.5 years, and Dr. Hardin was great with treating her mysterious lung infection (prognosis was not good, but she pulled through) and she has limited use of one of her back legs for reasons unknown. Thanks for reading! Keep an eye on our Facebook page later this month to nominate your pet for May’s Pet of the Month.